View of the expanded San Francisco Museum of Modern Art from the Yerba Buena Gardens. 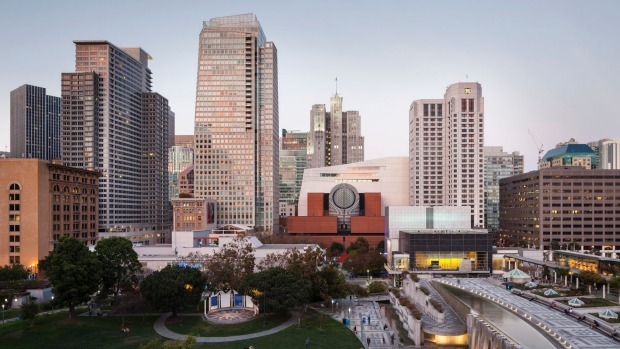 When San Francisco's vastly expanded Museum Of Modern Modern Art opened its doors for the first time in May, the full extent of the transformation became clear. Locals had watched in amazement as the stunning, 10-storey, futuristic building took shape. But only when you get inside do you appreciate the full genius of the design, which blends in seamlessly with the original structure by Mario Botta. International architectural firm Snohetta (founded in Norway) has already won World Architecture Awards for both Egypt's Bibliotheca in Alexandria and the Oslo Opera House, so no one will be surprised if the eco-friendly SFMOMA – with one of the largest "living" walls of plants in the US – starts picking up prizes soon. New exhibition space at the San Francisco Museum of Modern Art has been designed by international architectural firm Snohetta. 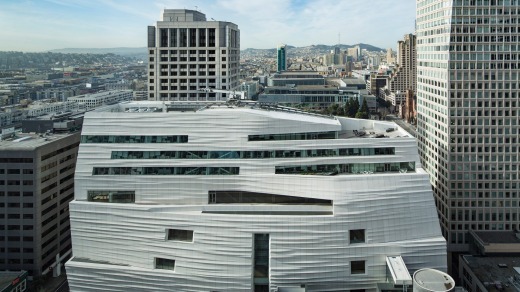 If Botta's museum turned inwards, the new SFMOMA deliberately opens its arms to the city, encouraging visitors to step inside with good cafes and spaces for reflection. Yet the greatest bonus is that Snohetta's design virtually triples the exhibition space. And when you have a collection as superb as this – undoubtedly one of the finest concentrations of contemporary art in the world – you want to put as much of it on display as possible. However, what you need to know is this is the museum collection that Gap jeans helped to build. Much of the new exhibition space is reserved for 260 works – we're talking Andy Warhol, Roy Lichtenstein, Jasper Johns, Chuck Close and Alexander Calder, for starters – which were lent to the museum on a 100-year loan by Doris and Donald Fisher, the clothing billionaires and philanthropists. The late Donald Fisher (who died in 2009) was running a hotel renovation business when he bought a pair of Levi jeans. Like Levi Strauss (the fellow San Franciscan who invented the riveted jean as a practical working garment for miners in the Californian gold rush), the Fishers were Jewish. When Fisher tried unsuccessfully to return a pair of Levi's that did not fit in the 1960s, he and Doris decided to open their own store in SF, carrying every Levi style in every size, along with records and tapes to capture the youth market. They called it The Gap, after the then-current phrase "The Generation Gap". It went so well they started manufacturing their own jeans. Then they bought a mail-order catalogue business run from only two stores that no one had ever heard of: Banana Republic. So what did they do with their $US3.3 billion nest egg? 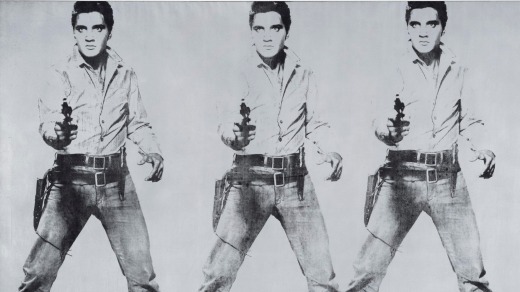 Warhol's 'Triple Elvis', part of the Fisher Collection at the San Francisco Museum of Modern Art. Lots of things, but they loved contemporary art, so began collecting art. Lichtenstein – celebrated for his parodies of comic art – was among the first. 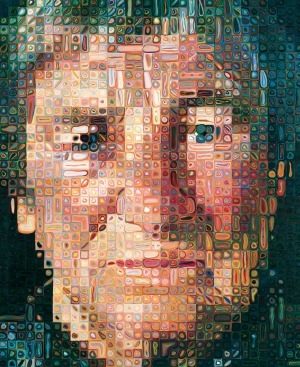 They began buying his work in the mid-1970s and their collection comprises 24 works over four decades. 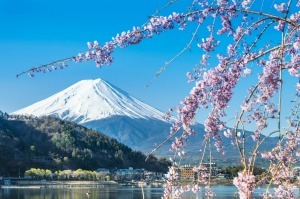 It's simply stunning. Early on the Fishers made a pact. They would never buy a painting, sculpture, mobile or print either was unsure about. That makes their collection individual, personal and a unique record of an artistic progression. 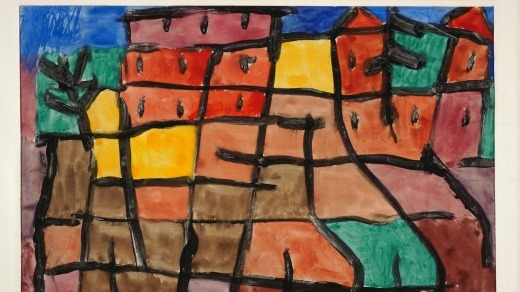 'Untitled' by Klee, part of the Fisher Collection. The Fishers were late adopters of Warhol. They only began collecting his works in 1987, the year he died. By that time, Warhol's reputation and relevance to the history of art was in doubt, as was the marketability of his works. There are 20 Warhol works in their collection. His silk screens of Triple Elvis (in unlikely cowboy costume from the 1960 film Flaming Star), National Velvet (showing the young Elizabeth Taylor descending into inescapable oblivion) and America's Most Wanted No 12 are haunting beyond belief. The Fishers were most interested in Warhol works that explored "the ephemeral nature of fame rather than the violent car crashes and everyday tragedies", which were another part of his clash with destiny. But none are so moving as Warhol's self-portraits. Seen together, as they are here, they show a shooting star sure of his own self-immolation. Of course, SFMOMA has wonderful works that it gathered since it was founded in 1935 as the first West Coast American museum. There are three Jackson Pollocks and at least two by his wife, Lee Krasner. Then there are Cy Twombly's graffiti-like scribblings, works by Matisse, Duchamp, Miro, Klee, Dali, and perhaps the biggest drawcard: six paintings by Diego Rivera, and his even more famous wife, Frida Kahlo (she of the history's most dramatically joined eyebrows). Yet despite the glittering cast of artists, one by the relatively unknown Duane Harbon is proving the most popular. Scores of visitors pose to have their pictures taken next to the cop standing guard near the Warhols, though the patch on the uniform ("Wisconsin State Police") should give the game away. It's an incredibly realistic and life-size image of Harbon's son (a policeman in real life). Who says modern art can't be fun? 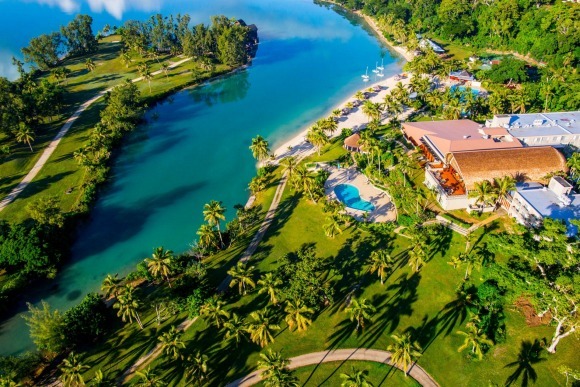 Fiji Airways has a new, twice-weekly flight from Nadi to San Francisco, with connections to Sydney, Melbourne and Brisbane – which allows a Fijian stopover for a few days on the way there or back. fijiairways.com. San Francisco Museum of Modern Art, 151 Third Street. See sfmoma.org. 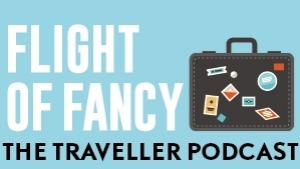 Steve Meacham travelled courtesy of Fiji Airways and San Francisco Travel.